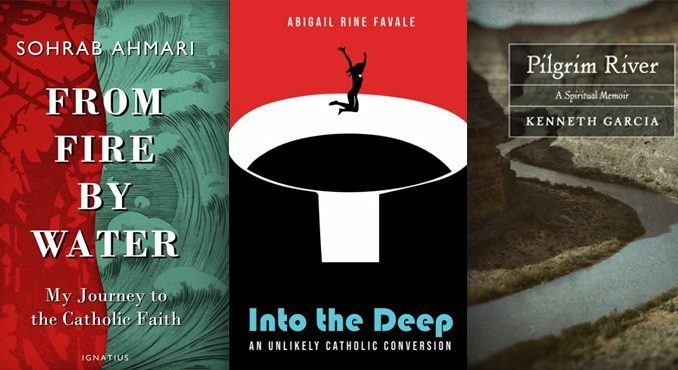 Recent spiritual memoirs and conversion accounts by Sohrab Ahmari, Abigail Rine Favale, and Kenneth Garcia demonstrate that while the Church’s public presence dwindles, its secret and almost invisible conversions will continue. what is it in the human heart that makes us rejoice more intensely in the salvation of a soul which is despaired of but then freed from grave danger, than we should if there had always been good prospects for it and its peril slighter? . . . the joy of your Eucharistic assembly wrings tears from us when the story is read in your house of a younger son who was dead, but has come back to life, was lost but is found You express your own joy through ours . . . 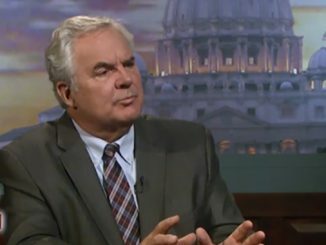 I have been wondering much the same thing for a long while now, ever since a young woman approached me, one evening, and began asking questions about the Church. It took me several minutes to figure out what she was reaching after, and then I realized she was mulling the question of her own conversion. At the time, which was a time not very different from this one, the scandals in the news and the dysfunction—theological, pastoral, and liturgical—of so many shepherds of the Church left me nonplussed by her curiosity. Why would one enter our Church, I wondered? What could possibly attract someone to a communion whose appearance, as the prophet Isaiah confessed, “had neither beauty, nor majesty, nothing to attract our eyes, no grace to make us delight in him” (Is 53:2). What, I wondered, except for the fact that it is all true? But, who could know that while still outside it? Such is the mystery of conversion and the mystery of our joy at learning of someone’s conversion. We sense the astonishing goodness of what had seemed impossible, inconceivable, unintelligible not only becoming possible, but rather, in the telling of the story, already having become real, become fact, a certain and definite testimony to a goodness known from within our souls suddenly set before us, out in the world. But this is not all there is to be said. And so, I have spent the last several weeks reading spiritual memoirs, conversion stories, by three writers who, like Victorinus, sought entrance to the Catholic Church sometime in their maturity. I chose to read three because each had separately excited my curiosity and, on first browsing, seemed likely to offer very different tales. Abigail Rine Favale, raised in an Evangelical family, amid the enchanted hills of Utah, and later in the haunted, isolating mountains of Idaho, would also embrace a secular church. Western feminism would mingle with her evangelical sentimentalism and compose an attractive, intellectually exciting, if vague spirituality, before, as she tells us in Into the Deep, an instinctive, almost accidental conversion to the Church begins her journey into the fullness of faith and the complete transformation of the soul by its loving discipline. Finally, I turned to Kenneth Garcia. Garcia was raised in a religiously indifferent home, the son of an absconding alcoholic father, and grew up in the mountains and waste lands of Nevada. Where so much is open wilderness, unsettled, unoccupied, and untouched by human hands, a sort of formless, drifting freedom and the hollow coursing of the wind led him, by slow drift, into the Church. Hence, the title of his memoir, Pilgrim River. Though sensing the self-sacrificing power of the Shiite martyr Hussein, and the shame of his “honorless,” often drunken father, Ahmari comes to the United States with his mother specifically to escape religion and to lead an “authentic,” unconventional life after the fashion of the father he could never fully respect. Resettled in Utah, he quickly comes to despise the Mormon-settled, inexplicably religious, American landscape and seeks refuge, first, into combat boots and “goth” music, and then into existentialist novels, the nihilistic prophecies of Nietzsche, Marxist militancy, and, at last, postmodern theory. He believed in nothing except the dissolvent power of his own intelligence to see through every “ideology,” his confident intelligence justifying the louche and drunken behavior of a modern liberated man. He seems incapable of doubting his own unbelief until, while serving in Teach For America, he encounters an Israeli immigrant and fellow teacher who questions the postmodern politics of guilt that skulks under the mantle of “diversity” and the materialistic relativism that consigned the poor students they were charged with educating to helpless victimhood. Yossi, the Israeli, insists on high standards and formal decorum in the classroom, and his students genuinely gain an education, while Ahmari’s blend of militant idealism, complacency, and skirt chasing in his evening hours, achieves nothing—nothing that lasts, anyway. This first experience of seeing moral character and spirit matter more than material conditions and, as the postmodern theorists would put it, “structures of power,” leads him to reject his materialistic and secular catechesis, but only gradually. Arthur Koestler’s Darkness at Noon, a classic novel of the Stalinist show trials, helps him to realize that all he took such pride in knowing was mere excuse-making, it was all a lie meant to shield us from the reality of conscience, our capacity to know good and evil. Ahmari’s intellectual growth is not matched by moral maturity. A binge drinker and habitual carouser, he finds himself, one Sunday evening in New York City, tasting the wretchedness of his own tankard of self. Idle and wandering, he inexplicably enters a Capuchin Church near Penn Station, and sits through Mass, shedding tears of repentance. The most unusual and engaging feature of this story is how alien Christianity initially is to Ahmari. He knows virtually nothing about it; it has no instinctive “childhood” pull upon him that the skeptic might easily explain away with a few crude references to Freud. 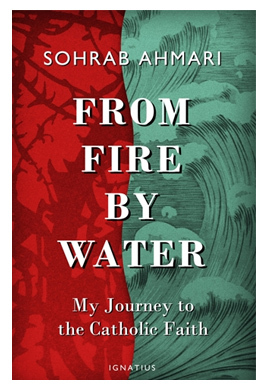 Reading Robert Alter’s translations of the Torah and Pope Benedict XVI’s Jesus of Nazareth are quite literally first encounters for Ahmari with the phenomenon and spirit of Christian faith. But even knowing nothing, in that Capuchin Church, he had stopped to cry before a photograph of the Pope. Somehow, his soul was yearning for submission to the authority of the Church, of the Pope, and so also of Christ. As might any young deracinated, cosmopolitan professional, Ahmari moves from New York to London, to work for the foreign edition of the Journal. But two episodes would shatter what otherwise might have been just one more jaunt in a life of secular freedom. First, amid the migrant crisis, he flies to Turkey, in hopes of going undercover and joining a train of Afghan migrants as they take the last step of their journey from Instanbul to Greece. The filth of the safe house he enters, that “House of the Cape of Olives,” the merciless cruelty of his fellow migrants, and their poverty and suffering too, become for him the image of fallen, unredeemed man. We ourselves are hell. Ahmari is a journalist in the age of social media. He begins his memoir by describing an episode on “Twitter,” where he, much to his regret, first announced his plans to enter the Church. The quality of his prose sometimes reflects our new electronic idiom, veering from the subtle and elegant to the crudely telegraphed (e.g. sentences addressing the reader with the imperative, “Take . . .” and the awkward fragment, “Ditto for getting married”). I note this not as a criticism, but because it inadvertently expresses one of the compelling features of his story. Here we have a man whose intellect was formed largely by a callow and superficial modern West, but whose conscience detects, little by little, truth in its ancient features and eternal nature. Receiving his catechesis from a venerable descendent of Newman, his conversion does not parody as farce the august, romantic stories of earlier generations of converts, but rather repeats their stories in compelling manner, so that, even now, he joins with them in communion. He is indeed a product of his time, and yet his soul has overcome history and joined itself to the Body of Christ that alone endures forever. 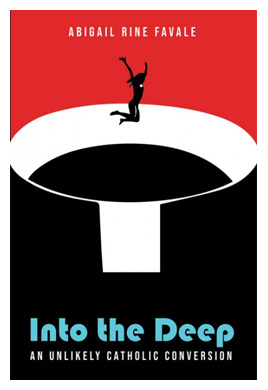 Abigail Rine Favale’s Into the Deep is subtitled An Unlikely Catholic Conversion, but in one sense that is misleading. 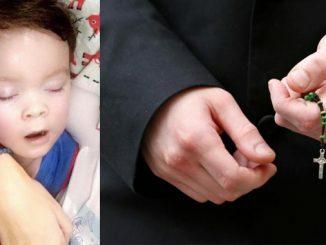 As a three-year-old riding along in the backseat of her father’s truck, she hears him ask if she and her brother accept Jesus Christ into their hearts. And she does. It is the first of many conversions, or degrees of conversion, in a book that unfolds almost like a cubist portrait of conversion. Favele was raised in a devout evangelical family, and, from early, she felt drawn in two seemingly opposed directions. She was not of herself especially devout, but rather tepid; but living among serious Christians, she was easily carried on the tide of faith, from church to church, and on to a small Christian college in Oregon. All along, however, the pull of sexual desire, a sense of sin and remorse, as well as discomfort with the teachings of her “Bibliolatrous” churches, drew her away from belief. The tension between the two led her to take an interest in feminist hermeneutics of the Bible. In the attempt to reconcile feminism and evangelicalism, she gradually embraced the minimalist liberalism of the Anglican Church before feminism itself became a kind of spirituality dissevered from Christianity. In her twenties, she would find herself on the Scottish island of Iona, an ancient stronghold of medieval Christian devotion, whereon she wanders lonely as a cloud in the rapture of a vaporous feminist spirituality of her own making. Her entrance into the church of feminism, as it were, should have extinguished the residual Christianity of her childhood. But it did not, quite. Nothing did. Throughout her youth, as she believes and falls away, sins and reforms, she feels again and again the need, not to be “saved” once and for all, but to be forgiven, renewed, and strengthened by grace, and sustained by something outside her own heart or subjective intellectual inventions. From the beginning, in other words, she sensed, without quite knowing it, the necessity of the sacraments. In 2013, she calls a Catholic parish to inquire about being received. A nun answers. Favale thinks entrance into the Church will at once give her the sacraments she craves even as it will allow her to be more flexible, heretical, and tepid in her beliefs than would the close-knit, “small minded” religious communities of her youth. She was right about one thing, wrong about the other. By midway through the book, she has been received into the Church; her conversion is sacramentally completed. Except that it is not. In ten final chapters, she retells the story of her conversion from different angles, as she herself stares on in amazement to see her tepid, “feminist,” liberal soul reshaped by the authority of the Catholic Church. Ahmari’s memoir concludes with a concise, well-chiseled chapter that affirms the dogma of the Church and summarizes his reason for believing. The balance of Favale’s book comprises a much more extensive and exploratory series of such affirmations. Just as Augustine’s Confessions, though best known for its autobiographical narrative, is, in its bulk, a grasping reflection on the act of God’s creation of the world, so Favale follows the movement of the soul as it proceeds from willful, sentimental individualism to a full self-surrender to the Church, as a way of life, as administrator of the sacraments, as a mother who gradually and gently leads us through a pilgrimage of sanctification, but who also makes great demands upon us. Favale excels at conveying in winsome fashion her pre-conversion feminist spirituality and does not hesitate to restate with blunt embarrassment the self-righteous dogmata of the liberal feminism that was taken for granted by her and nearly everyone she knew. This lends still greater power to the carefully articulated record of her intellectual and spiritual transformation at the hands of the Church, which is the great strength of this memoir. And so we see, in one sense, her conversion was not unlikely but inevitable; she thought that the Catholic Church would give her what she wanted—the sacraments—without requiring her to give anything of herself in return. And this could have been the case; the Church is now full of the lukewarm, who quietly, or not so quietly, dissent from her teachings, all the while acting as if everything were fine. When Favale is confronted by this in the form of a priest, in confession, who tells her she need not confess the use of the birth control pill, if her “conscience” dictates it as licit, she is brought up short. She had entered the room, prepared to resist his arguments for Catholic moral teaching. Meeting no resistance from him, she is disappointed and feels compelled to study and accept the discipline that the priest himself declined to offer. This Favale describes as her second conversion, slower and harder than the first, as she lets go of so much that she has made to believe for herself and submits to the faith of the Church. The intelligence and precision with which Favale narrates this slow, second conversion is a wonder to behold. Favale’s early practice of a strained, super-subtle kind of scholarship that tried and failed to reconcile feminism and Christianity serves her well as she attends to the slow transformation of her intellect through a dogged, unrelenting meditation on the challenge of truth. We are not only told what she comes to believe, but are led by her into the heart of that belief. At once intimate in detail of her experience of being a wife, mother, and college professor, and finely constructed as an account of why she has come to believe, we are continuously challenged, as her readers, not just to take consolation in her story but to recognize why we, too, must be converted. The Dominican priest, in his hooded robe of gilded white, went to the tabernacle, where the consecrated hosts—the sacramental Body and Blood of Christ—are kept in repose. When he opened its doors, the people around me fell to their knees and I followed wordlessly, my eyes fixed on the tabernacle, which seemed lit up from within, light spilling out of it from an unknown, inward source, as if behind those golden doors was a window letting in the sun. And there was the sun itself! The monstrance, rays that signaled what it contained: the source of Light and Life himself, come to us now, hidden under the humble appearance of bread—Jesus Christ, the Word made flesh. Let us adore him. Unlikely and belated, yes, but profound and complete, this conversion which had only just begun with the reception of baptism. Among the many insights that make this an invaluable book is Favale’s attention to how suitable to human nature are the sacraments and how in conformity with, and completing of, nature as a whole is the moral teaching of the Church. The reductive simplicity of evangelicalism leaves one without the support, the chance for ongoing forgiveness and renewal, that we need as creatures living out our destinies in time. Human beings were made for the sacraments, and Christ instituted the sacraments for the sake of mankind. The experience of motherhood, in its reminder that we are by nature dependent, interrelated creatures who essentially rely upon continuous acts of self-giving and even self-sacrifice, blows the doors off the feminist ideology she had built around herself. Nature thus anticipates and prepares us to receive the revelation, the grace of Christ’s self-emptying love. 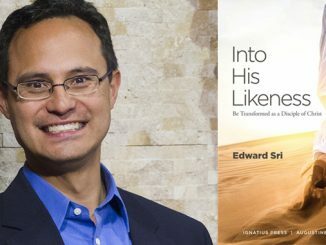 Ahmari’s pilgrimage to the faith led away from a secular liberalism, Favale’s from a sentimental feminist skepticism; Ken Garcia’s memoir tells a very different story, that of an initial, overpowering, intimate sense of God’s presence in, and transcendence of, the world, a sense to which it takes him decades to respond adequately. He has been saturated by God; the great temptation is not unbelief but pantheism. The gift of the Church, when he eventually receives it, nonetheless resembles what led Ahmari and Favale into its body: the authority, discipline, and tradition to give shape, give form, to our otherwise unruly lives, in response to the self-revelation of God. Born in Elko, Nevada, to an unloving, abusive, and religiously indifferent home, Garcia’s first memories were of the rocky desert wilds of the far West. Stark and unsettled, the landscape seemed at first a place of formless matter, unshaped by a human culture but merely scored by the immemorial movements of tectonic plates and the hollow, everlasting wind. Garcia, at first, resembles many older writers of the American West, whose particular kind of literary realism emphasizes not the sordid Darwinian cruelty of human beings (as did eastern American and European realist writers), but the barren savagery and crumbling emptiness of the land. A territory first settled by miners who cared for nothing but the minerals they could rip from the earth and haul away, and whose place names reflect as much, from Golden and Leadville to Boulder, the West has given birth to writers who reflect on its appealing sublimity only to dissect it down to its base elements, as if to demonstrate that what appears a spiritual whole of immeasurable power is merely a coagulation of quantifiable material units. Garcia’s youthful memories are indeed of material measure. Hunting and poaching, surveying lands for a mining company, getting drunk and visiting the whorehouses on the outskirts of town, all seemed to him a drifting sequence of events adding up to nothing and leading nowhere. After losing an eye in a hunting accident, Garcia takes his insurance money and spends the next several years reading books and wandering the southwest—sometimes as far as Alamos, Mexico, where he lodges with an alcoholic American expatriate along with his wife, a former prostitute who visits him each night under the cover of darkness. This was in the early nineteen-seventies, and Garica’s eclectic reading truly recalls that age of pocket-sized paperback and on-the-road enlightenment; it includes a great hodgepodge of spiritual classics and existential novels, many of them leftovers from earlier fads for Oriental wisdom and some of them major works theology, including Henri de Lubac’s The Discovery of God. Spring wildflowers bloomed throughout the lower basins in late June: purple fireweed, found throughout the Intermountain West, and arrowleaf balsamroot, a yellow flower with long pointed petals and wide green sepals that look like stretched-out maple leaves. I hiked between fir, limber pine, and white bark pine trees in the higher elevations, setting up camp in the shade of aspen groves lower in the basins, along streams or beaver ponds. I filled my canteen in the creeks. Writing from late in life, Garcia reflects that this journey through the mountains set him on a quest that gave loose, drifting, but definite shape to the rest of his life. Having seen God at once in nature and infinitely transcending it as its creator, Garcia retreats ever further into himself, seeking divine wisdom. He soon loses his hold on the people and place around him, as if this vision has unfitted him for the world, and so begins a search for some community and tradition that can anchor all that within him formlessly swells. He feels as if he’s becoming a ghost, on the verge of insanity, and in danger of suicide. He needs help. A Catholic priest, unimpressed with Garcia’s experience of “natural” revelation, proves too cranky to be of much aid. He returns to college, having dropped out after his accident, but finds the modern research university’s fragmentation of study frustrating; he seeks wisdom, not specialized knowledge. A woman helps him with his Spanish and they soon fall in love and marry, but this lasts only a few years. Garcia leaves, returns to Mexico, to write a novel. What will you write? his wife asks him upon their separation. A young man’s “quest for self-actualization,” Garcia replies most solemnly; his epiphany has changed him, but lacking in form, it does not make him immune to the New Age claptrap of the times. Living in Mexico and writing, however, he begins to pray with the devote villagers around him. Not through books, theology, or eastern wisdom, but through a vision of community, tradition, and finally the Cross—that self-emptying exposing to our eyes the vanity of every “self-actualization”—Garcia is brought into the Church. He attends the short-lived Old College of the Humanities, founded by a former president of Gonzaga University, and this opens to him the life of learning united with spiritual discipline he had long sought. While in graduate school, he falls in love and marries; as his family grows, he ascends from one university administrative post to another, until, at last, he is invited to the Institute for Scholarship in the Liberal Arts, at the University of Notre Dame. There, he hopes to aid Catholic universities in reintegrating all the scholarly disciplines, including the physical sciences, under the grand science of theology. Garcia’s memoir leaves unanswered the success of that endeavor. I will just note that he has published an award winning book on theology and the university and that he held a major conference at Notre Dame several years ago in support of that reintegration (which I attended). In the memoir, his attentions take a final turn to the struggle to maintain a strong marriage and maintain a devout Catholic home amid the travails of raising children, at least one of them deeply troubled. As dramatic story telling this, in a sense, disappoints; the book is episodic and essayistic rather than conclusive. And yet, it begins with a great burst of visionary wisdom; it traces the uneven, ever-failing efforts of a man to live up to the goodness revealed to him and to submit to a discipline outside himself that may make that vision fruitful; and it looks back from the wisdom of old age to suggest that conversion is not a singular event, for each day we must be reconverted if, in our knowledge of God, we are also to become images of God. Garcia’s story is distinguished in many ways, but the most important among them are its refusal of the typically modern assumption that nature and supernature, God and the world, are fundamentally estranged from one another rather than intrinsically related as Creator to creation, as father to child. 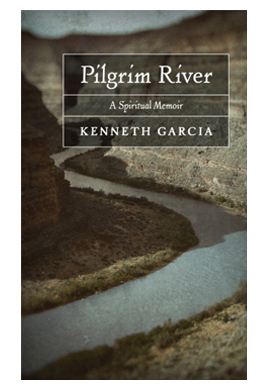 All three of these memoirs suggest that the spiritually blind still feel a pull upon themselves, drawing them back to God; Garcia’s mature perspective conveys with wounded grace how natural that pull really is and how much of a lifetime it can take for us to surrender ourselves to it. I found some superficial resemblances in these stories. How curious that all three should have spent a portion of their lives in the far West, for instance. How unsurprising that each should feel the enticements of the world and be led at last to the one who overcomes the world. But there were more profound commonalities as well. When Augustine marvels at the conversion of Victorinus, he feels compelled to see himself in the man and thus to imitate the actions of the one who is his own image. Augustine saw that the story of conversion and the saints life–such as Athanasias’ Life of Anthony—were the distinctly Christian form of literature. Whereas he and his fellow pagan Romans had their souls formed on Virgil and the rhetorical grandeur of the epic, and perhaps their souls deformed by decadent Roman drama, the Christian story of conversion was the type of humane letters proper of the human race reborn under the reign of Christ. We are either compelled by its witness to conform ourselves to its image, or we are renewed to share in the joy of those whose souls, like ours, are now conformed to Christ and so also joined with ours in communion. This entails that, whatever the particular furniture or episodes of the Christian stories, their arc, their fundamental form will be the same. And it answers Augustine’s initial question: we take joy in the conversion of the lost, not only because the lost have been found, but because our own life and love is enlarged by communion with them. I found an answer to my own question in these books as well. For all the ugliness deforming the appearance of the Church in our day, what is most ancient and everlasting of its beauty is still visible, indeed readily so, and in at least three ways. First of all, the Eucharist still calls us all. 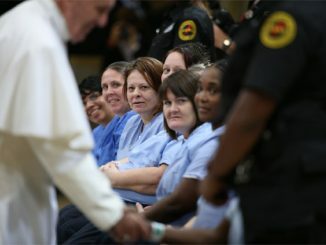 Some years ago, a Unitarian friend said to me that the Eucharist must be a great obstacle to people’s joining the Catholic Church. A friend of hers, who was Catholic, had told her that “you can only believe it if you’ve grown up with it.” I demurred. So far as I could tell, the Eucharist was not a point of resistance but the very reason for which converts had usually entered the Church. The authors discussed here concur. In each, the life of the sacraments brings their lives to order and (this is most clear in Ahmari and Favale) the Eucharist itself places them in the fearful, sanctifying presence of Christ. Second of all, the Church’s moral and intellectual tradition lives whether in the catacomb, cathedral, or capital. I find something sorrowful to think of Ahmari reading a few books by himself on the road to conversion, and in Favale’s having to discover the Church’s moral discipline through, as it were, academic research, when a priest fails in his pastoral responsibility. But the Church, even at its most visible, is always transmitted by the invisibility of spirit. We are called to communion with the whole Church and nothing else is the full truth. In the Confessions, Augustine records Victorinus facetiously asking, when he has not yet made his faith public, “is it the walls that make the Church?” But though the fullness of our life is found convened in the pews at Mass, sheep and goats mixed together, the ancient records of the spirit found in Catholic saints’ lives, teachings, and philosophy and theology, are the invisible currents that lead us there. As the Church’s public presence dwindles, its secret and almost invisible conversions will continue. And, third and finally, the Church is a summons to form. Another friend of mine was the daughter of a Lutheran minister. Years ago, she used to attend Mass with my family and me, because there was no Lutheran church nearby. One day, I was reflecting aloud on what I appreciated in the novus ordo Mass but also on what a thought was theologically impoverished when compared to the extraordinary form. I left off suddenly, when I realized what she was thinking, and then she said it: impoverished or not, the liturgy still impressed her, seemed obviously superior to anything else she had encountered. “But,” she concluded, “I just wish I could receive communion.” We want our lives to be whole. Everyone is seeking was Garcia half-mordantly calls “self-actualization.” In order to become fully ourselves, we have to give ourselves away, we have to turn ourselves over to the One who alone can reshape us and fit us for glory. The Church still does this. Even when it seems to fail, it succeeds. These memoirs—saints lives after their own fashion—testify as much and promise a new age in our Church as beautiful and demanding as any other. Well said, James Matthew Wilson. Stories of conversions do bring us joy, don’t they?. I tell occasional converts who I meet at the oratory I attend–where the sacraments are celebrated in the traditional form –that their conversion affirms for me that the Holy Spirit is alive. It’s a wonder to see that God reaches out to people who don’t believe and reveals Himself in various alluring ways, even when, as often happens, they are met not with welcome but with discouragement from priests. I came back to the Church after leaving in an adolescent fit of intellectual hubris, and it was true for me too that the Eucharist and the authority of the Church led me home again.